Arnold James design, supply, install and maintain renewable energy solutions. Our typical clients include Local Authorities, property developers and housing trusts. 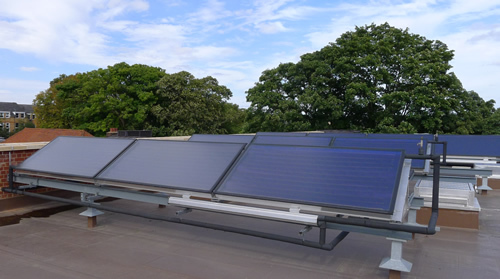 Arnold James is a renewable energy contractor for microgeneration of Solar Thermal and Ground/Air Source Heat Pumps and Rainwater Recovery. £15million in grants from the government have been made available via the RHI (Renewable Heat Incentive) Premium Payment Scheme, giving help towards the purchase price and an annual payment for the installation of eligible systems such as biomass boilers, heat pumps and solar thermal panels. These will be available for both domestic and non-domestic installations including schools, libraries, etc.